The book opens six years in the past, at Annabelle’s London debut. Unfortunately, Quinton (Quinn) Carlisle couldn’t stop teasing his long-time acquaintance, leading to misunderstanding, scandal, and heartbreak. Fast forward to a month before Belle’s twenty-fifth birthday, by which she must marry, or lose her home and security. Quinn is beguiled by Annabelle, and he loves to tease her to light her inner fire. He can’t explain why she holds such attraction to him. Seeing her now, six years older, he is taken aback by the woman she’s become. But Quinn is heading to America, to keep a promise he made to his deceased father, and he will never allow himself to fall in love anyhow. Lady Ainsley, widowed caretaker and mother figure, wants love for Annabelle, but knows Belle’s security is more important. She wants/needs Annabelle to find a match, so she calls in her grand-nephew, Quinn, to help sort out proper suitors from fortune hunters, putting the pair together for the first time in six years. I absolutely adored When a Scoundrel Sins and it’s two main characters, Belle and Quinn. It’s obvious to everyone but the pair, that they are two peas-in-a-pod and meant to be together. However, Quinn is so wrapped up in his fear of love that he uses his promise to go to America as a wedge to drive Belle away. Yet he’s so inexplicably enamored by Belle that he can’t stop touching her and sending other suitors away. “But this, this wasn’t just a kiss. This was so much more. The boy has it bad but refuses to acknowledge his love. Then there is Belle who knows she has feelings for Quinn, but keeping her home is more important than a marriage based on love. She tries to convince Quinn that they should marry for convenience – she’d even let him go to America – but he’s so stubborn. So she continues looking for a man who will let her manage her own estate. I absolutely love how Quinn and Belle banter, flirt, and push back and forth. It’s so obvious they are in love, yet refuse to give into their feelings. This sets up for some highly emotional scenes, which pulled on my heart, giving me all the feels. 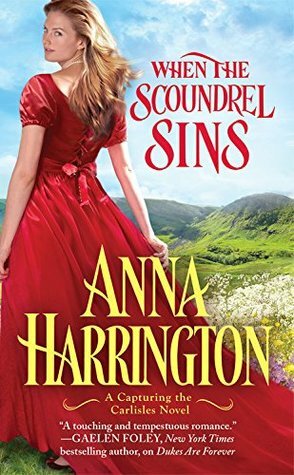 When a Scoundrel Sins is another wonderful story in the Capturing the Carlisles series. I adore Quinn and Belle, and absolutely love the feelings – their fears and passion – infused into the characters. The author so beautifully put these emotions out there, making them real and connecting me to the characters. When a Scoundrel Sins is a must read!